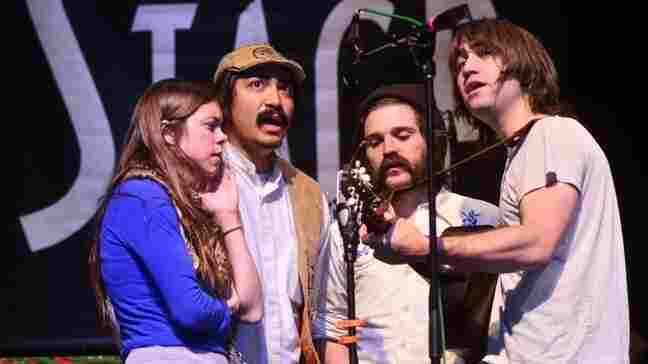 The Low Anthem On Mountain Stage The Rhode Island indie-folk band returns to West Virginia's most famous stage for the second time with an armful of instruments and a handful of new songs from their album Smart Flesh. The Low Anthem performed on Mountain Stage. For the making of Smart Flesh, the latest from Rhode Island indie-folk band The Low Anthem, the four members spent three winter month recording in an abandoned pasta sauce factory, capitalizing on its resonant, cavernous sounds. In their second appearance on Mountain Stage, the band recreates the sounds of Smart Flesh, drawing from a variety of musical styles and an even greater variety of instruments; they switch back and forth between 11 instruments during their five-song Mountain Stage set, including World War II-era pump organ, dulcimer, clarinet, trumpet, fiddle and musical saw. Founded in 2006 by former baseball teammates Ben Knox Miller and Jeff Prystowsky, the pair found a common interest in their love for gospel, folk and blues. The duo was soon joined by classical composer and former NASA technician Jocie Adams, and since their last visit, multi-instrumentalist Mat Davidson was added to the lineup. This segment originally aired on April 20th, 2011.